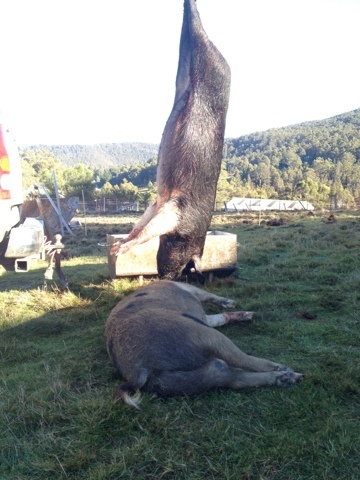 A warning to vegans, vegetarians and others who prefer to meet their meat long after it's processed, this post contains photos of dead pigs and blood. I would argue that these photographs should be no more offensive to animal lovers than a picture of a big mac, but I thought you deserved fair warning. Our three pigs when they first came here a year ago. 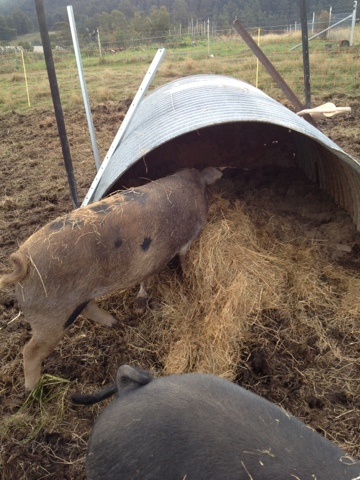 Guanciale, the male pig, was sent to the abattoir at 8 months old. Did you know pigs love to run? Fast? That they love warm milk on a cold morning? That they are utterly trusting creatures and quite hairy? They love to be touched and will knock you into the mud whilst passionately pressing against you in the middle of a good scratch? That the only time mine have bitten me was to see what blunstone boots taste like? That they dig, they dig like crazy if you give them soft earth to get stuck into? That they graze? When you put pigs on new ground, before they dig they will eat the tender tops of the grass and clover. That they make their own beds? I put hay into my girl's house and they mound it up into a snug bed. They'll also grab prunings and woody stems of weeds and use them to build up their bed, and they seem to relish the task, shaking tufts of hay into loose strands before padding them down. They've also mended the draft in their house with their milk dish. That they eat delicately? Our girls will hold a tasty plant down with one hoof and nibble the tender tips of branches. That they kiss? Well something like it. That a piggy back is an actual thing? 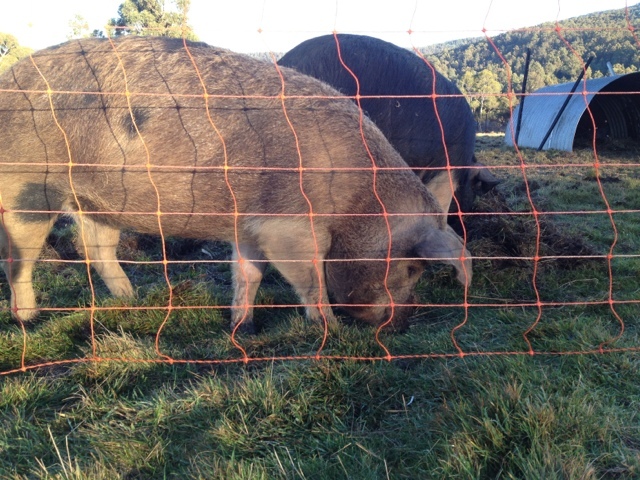 More of a power display by the bossy pigs than a mating thing as far as I can tell. Rillettes making her own bed. Rillettes and Lardo this morning. No inkling of what was to come. I miss them and I thank them. Tonight I go to bed with a heavy but optimistic heart. What we're doing with our pigs is not only driven by culinary, ethical, practical or idealistic motives, but also one I'm finding it hard to put a name to. There is a (possibly bizarre and twisted) part of my being that wants to own sadness. Our worlds have become monotone. We have taken away the need to feel icy winds on a cold day, to eat the bitter leaves of a plant, to feel the resistance to our teeth from an unprocessed grain, to have the scratch of wool clothing against our skin, the ache of a worked muscle, the pang of hunger in our bellies waiting to be sated, or the need to relate intimately to death. Our lives are so sterile that we have taken away all of the bitter things that make the sweet parts taste better, the cold that makes the fireside delicious. I think, to some degree, we need to have scratchy, bitter, chewy and painful things to be able to properly feel comfort and joy. I have had the luxury of choosing to connect with the life and death of these animals. I made the choice to pat them, to care if they had dry straw in their beds and a cool wallow on a hot day, and tomorrow I'll cook them a warm pot of scraps for their last breakfast, scratch their fur one last time, look away as they are shot and hold a bowl under their necks to catch the blood when they are stuck, probably with tears streaming down my cheeks. So many people tell you not to name an animal you are planning to eat. I would argue otherwise. The more distance we put between ourselves and the animals who provide us with meat, eggs or milk, the more we lose sight of the fact that they are sentient beings deserving of respect and compassion. It is this distance that allows us to perpetrate cruelty in the name of economics. Lardo enjoying a wallow last summer. It is done. Our little fat friends Lardo and Rillettes are hanging in a mobile cool room outside. I thought I wouldn't be able to see it through, but the butcher assigned me the role of taking the gun after the pigs were shot so that he could stick them and catch the blood. Then I was told to roll up my sleeve and stir the blood with my hand as it cooled to prevent it from clotting. After that it felt easier, and I didn't shed a tear, until now that is. In the busyness of rinsing caul fat, scraping hair, cleaning hearts, I didn't have time to think of how quiet the garden will be without the girls there. It will be one less chore in the mornings, but we will miss them keenly. But, come next spring, we will visit our friends and bring home a few more of their piglets to fatten on vegetables and use as carbon neutral cultivating/composting machines. Our youngest daughter wasn't too fazed, she just insists that we make Lardo into lardo and Rilettes into rillettes. Our eldest felt it keenly. Last night she thought she would be fine, this morning she cried, but was so incredibly pragmatic through her tears. A little angel. The pigs were there, and then they were pork. In their run, sniffing the legs of the butcher before he dispatched them. No stressful transport, no strange holding pens. The milk lady has just been and gave me a hug along with our milk. We will skim the cream from her milk and use it with the blood to make Matt's blood sausage. The livers and caul fat will be used to make a pate. We will begin the task of learning to cure our pigs, 200kg in all, and in a few weeks I will fry my first piece of home raised, killed, cured and smoked bacon, season it with a little tear of thanks for my porcine friends and relish every morsel. 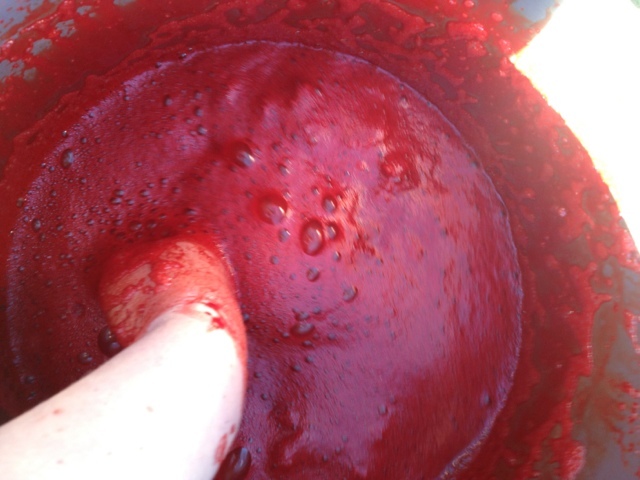 Blood being stirred while cooling to stop it from coagulating. Ultimately the reason we kept pigs was to cultivate. 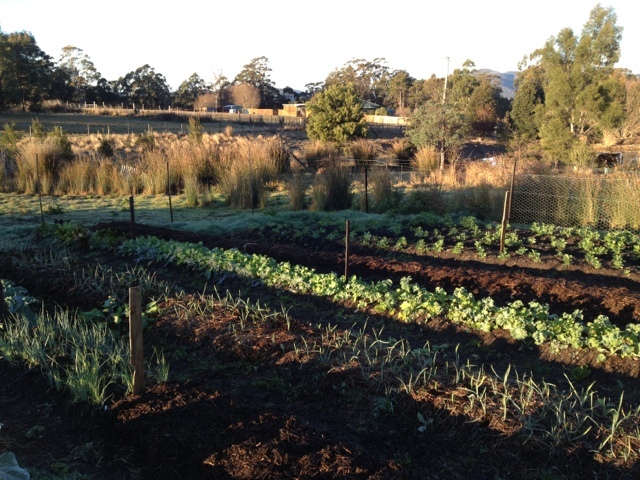 We hope to minimise our use of machinery in the process of growing food. This patch was a bare, impoverished paddock 12 months ago. The pigs spent two months here then we mounded the soil and grew pumpkins and tomatillos. Now we're harvesting kale and waiting for broad beans and garlic to mature. The pigs have since cultivated two more plots. Nicely expressed. The same butcher came to kill a cow and two goats last week, I'm so impressed at their services. The feelings such activities inspire in me are varied; I felt grounded, sad, proud and astonished at the beauty of the inside of a cow. Beautiful. A happy life, a quick death. Totally different from the life and death on "factory" farms! Wonderfully shared. I particularly liked the paragraph beginning "Our worlds are becoming so monotone...." very well said. (I continually encourage people to buy and eat bitter greens amongst their salad leaves) For me I cannot bear to name those we intend to kill and though I tend them with care and love, I refer to them as "the girls" and "the boys". I guess I fear that I would pet them and yes that makes it harder. Your children are fortunate to have these life experiences too. What an amazing post, and something that I struggle with daily. I'm both a happier, more whole person since raising my own food...and on a few days, a sadder, more conflicted person. 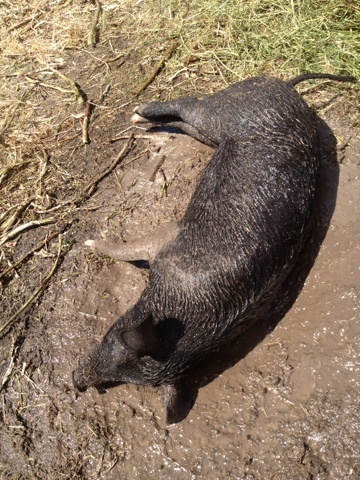 We have pigs as well that we're using to clear land, along with geese, chickens, bunnies and sheep. All will be food in some way or another, but for now, they are living happy, healthy, safe lives and I am sweating, worrying, and providing for them until their last bad day. Thanks for your beautiful article. We're just about to get pigs and I've been wondering how attached we're going to get and how it's going to be to say good bye. Thank you for your story, Paulette. I have grown and eaten my own chickens, and am now approaching killing and butchering one of our cows. I love my animals and give them the best life I can, and the quickest death I can. They are all named- as are my chickens. My cows treat me as one of the herd and we engage in mutual grooming. I am astounded how close the social grouping is in a herd, and how affectionate cows and bulls can be to their herd. I take responsibility for the food I grow and eat. I am a vehement opponent to factory farming and its cruelty. I would be proud to stand with any vegetarian against the cruelty of factory farming and unmonitored abattoirs, and I find no contradiction in combatting factory farming while eating my own free-range livestock. My livestock manage my forests and protect me against bushfires. It is time we got our priorities straight. We can love and care for animals ethically and still eat them. It is the unethical and cruel treatment of animals we need to unite against, rather than just a general ban on meat. 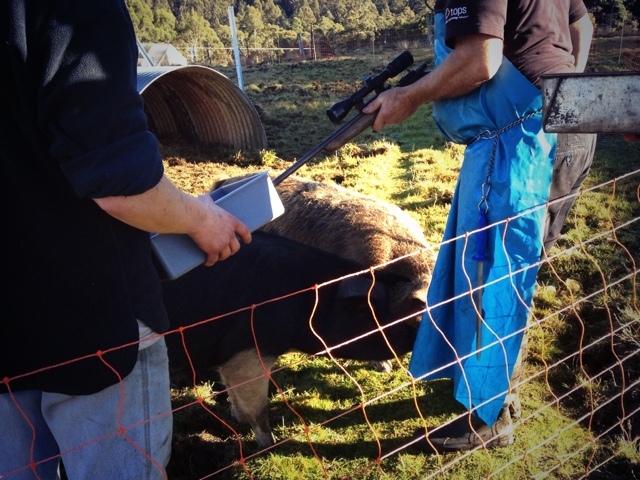 Thank you Paulette for a most eloquent account of your emotions and the actual event of shooting the pigs and the subsequent processes for your home-grown food. I echo your concerns about the disconnect between people and their food and have had to clip my own ear every now and then as I tend to (possibly) romanticise the relationships between humans, animals and Nature, in general. Does a tree mourn the loss of a limb blown off in a huge wind? I don't know however, according to Peter Tompkins (The Secret Life of Plants) plants have a sophisticated nervous system too. Death is essential for life, as KirstenMilkwood ponts out. I suspect the means of dying is the issue for many people.....perhaps we have the utopian belief that going to sleep and not waking is the ideal way to take our last breath. A gunshot to the brain is so quick......one minute the animal is breathing and the next minute, she's not. No pain. No squealing. No last-minute-thoughts or regrets. Just. Gone. 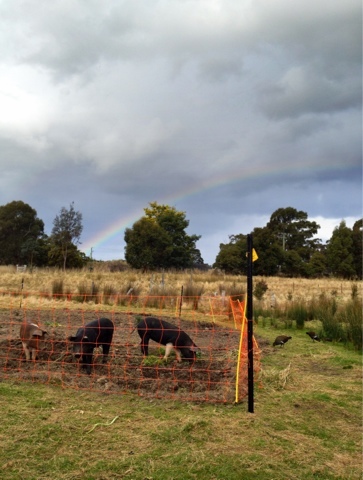 We have bought a 160 acre property with many micro-climates south east of Wagga in the Riverina and our first pigs arrive in a fortnight. 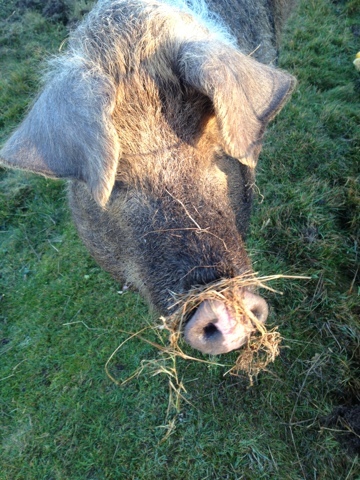 We want pigs for every reason you described - tractors, muses, fertilisers, companions and ...... food. This is the same for the cattle, chooks, turkeys and guinea fowl. We have deer on the place, many 'roos and rabbits, too. We will selectively shoot and eat them according to our needs. My thanks for a wonderful post and bon appetit with Rillete and Lardo. Wonderful article, so well expressed, I really appreciate your effort to display what happens, so often this side of animal husbandry is glossed over, homogenised meat consumption with cling wrap and black polystyrene. It is no small choice to grow and dispatch your own animals. Mobile butchers rank pretty high in my admiration list these days. I'm pleased you're on this interesting philosophical journey and you have the time and talent to write about it honestly and passionately. I hope you enjoy those first tastes. And thank you for the interesting facts about pigs. Beautiful words would love to read more on how you pastured them etc. This is my first visit I'll look around to see if you have written out it. I would like to use pigs in the same fashion in our gardens. I am a vegetarian transitioning into veganism. I feel however that I am realistic concerning the death of animals for food. As much as I choose not to eat animals or consume their products, I understand that many do. I choose not to judge. What I do choose to do though is encourage people to show respect for animals they kill and to do it in a way that causes no stress, fear or trauma to the animal. And I feel that this is how you have done it and I thank you for that. To not put these two animals through the horrors of an abattoir deserves a pat on the back for you. This is my first visit (from England) How refreshing to read this honest, sensitive, post. 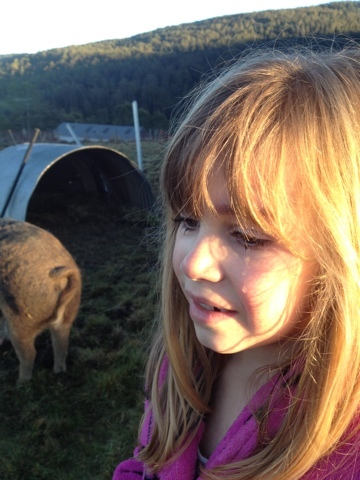 Thank you for sharing your thoughts and feelings along with the experience of turning your pigs into food. Our just-picked home grown bitter leaves or sweet leaves as we thanked the plants for providing, our home grown meat that we created with honour to the birds and animals who provided it taste different because we are in real relationship with it.